Shuttle Computer Handels GmbH, the European subsidiary of Shuttle Inc., one of the leading developers and manufacturers of compact PC solutions such as the world-renowned XPC Mini-PC Barebones, today launches the SX79R5, a new high-performance model for all Sandy Bridge-E processors with LGA2011 socket. "Power users and performance enthusiasts expect maximum speed and precision from their machines. With the SX79R5 we are giving them just what they're looking for," states Tom Seiffert, Head of Marketing & PR at Shuttle Computer Handels GmbH. "This internationally unique platform delivers extreme performance in digital content creation and in many other areas where huge volumes of data need to be processed extremely quickly." The SX79R5 is positioned at the very top end of the performance spectrum of Shuttle's Mini-PC product range. It supports Intel high-performance processors such as the i7-3820, i7-3930K and i7-3960X models with 6 cores, 12 threads, 15 MB cache and 3.9 GHz in Turbo mode. Up to 32 GB DDR3-1600 RAM can be installed in the Mini-PC in Quad-Channel mode. The two PCI-Express x16 3.0 slots accommodate two single-slot graphics cards or one dual-slot graphics card (e.g. AMD Radeon HD 7970 or NVIDIA GeForce GTX 680). Two Mini-PCIe x1 2.0 slots are available for expansions such as WLAN and mSATA-SSD. The new SX79R5 also offers a wide range of connections on the front and rear of the machine, including 4x USB 3.0 (1x with charging capability), 8x USB 2.0, 1x eSATA and S/PDIF. The motherboard also offers further ports with UEFI support: 2x SATA 6 Gbit/s, 2x SATA 3 Gbit/s and 1x RS-232. Two Gigabit network interfaces enable either speed increases during network transfer (load balancing) or enhanced failover. The aluminium case, which measures just 33.2 x 21.6 x 19.8 cm (DWH), comes supplied with a pre-installed Shuttle motherboard and a highly effective 500 W power supply unit with 80-PLUS certification. A particularly large heatpipe reliably cools the 32 nm micro-architecture of the Sandy Bridge-E processors with up to 130 W TDP even under load. 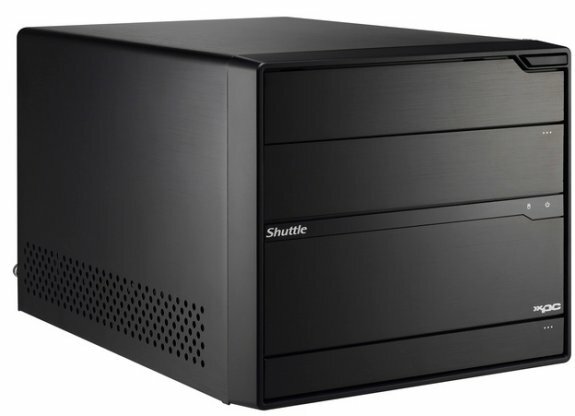 Shuttle's recommended retail price for the XPC Barebone SX79R5 is EUR 444.00 net. This product is now available.